Roy Porter was born in a small mining town but he moved to Colorado Springs with his mother at the age of eight, following the death of his father. In school he took lessons on the clarinet, however he always wanted to play drums. On Saturday nights he would hear radio broadcasts of Duke Ellington and Jimmie Lunceford. He also heard Chick Webb's famous drum solo Liza that made him even more determined to play drums. Roy graduated from high school in 1941 and decided to enroll at Wiley College in Dallas, Texas. In March of 1943, after he was the drummer for the Wiley Collegians' College band for almost two years, he had to leave college because his mother had become gravely ill. When she died one year later, he moved to Los Angeles where he played with guitarist Teddy Bunn. In 1945 he joined the quintet of trumpeter Howard McGhee. Bebop was just coming to fruition as a form at that time, and Porter was an enthusiastic convert to the new ways. His opportunity to link up with Charlie Parker arrived when Dizzy Gillespie brought a quintet from New York which featured the saxophonist. Parker wanted Porter on drums for his now classic Dial session on 28 March 1946, which was released as the Charlie Parker Septet. Parker went back to N.Y. And Porter continued to work with McGhee until 1947. In 1948 Porter put together a highly ambitious modernist big band which included future jazz greats Eric Dolphy, Art Farmer and Herb Geller. He played for a time on the San Francisco jazz scene with the likes of Hampton Hawes and Sonny Criss. In 1953 his addiction to heroin led to a two years stint in prison. Back on the jazz scene in 1955, he was featured in many different settings with Joe Liggins, Earl Bostic, Louis Jordan, Perez Prado, and Clifton White. 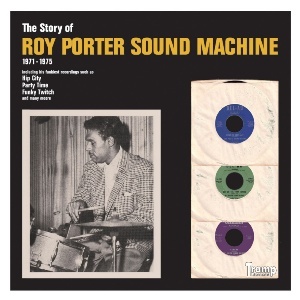 In the late 1960s he began working with a trio which he called Roy Porter Sounds. He later changed it to Roy Porter Sound Machine when he began to add more horns and other instruments. During the 1970s, Porter was busy playing gigs with the Sound Machine. They performed at dinner houses, nightclubs, and a lot of private parties for dancing. He released two albums under Roy Porter Sound Machine, „Jessica“ (1971) and „Inner Feelings“ (1975). Porter retired from performing in 1978 on health grounds, but continued to give workshops and ran his publishing company. At the age of 71 he released his last album titled Roy Porter Sound Machine '94 – Generation. Four years later, Roy Porter passed away on 25 January 1998.